What are Crows Feet and the causes? Crows feet are the fine lines that radiate from the corners of your eyes and are among the first wrinkles to form and can show as early as your 30’s. They are dynamic wrinkles, meaning they’re most noticeable when you contract the muscles in your face, such as when you squint or smile. Many factors contribute to lines and wrinkles, including sun exposure, squinting, smoking, and menopause. HydraFacial – is non-invasive, non-surgical procedure that delivers instant results with no discomfort or downtime. The system is immediately productive. The six-step process includes Detox, Cleansing/Exfoliation, Brightening Agent, Extraction, Hydration and finally Rejuvenation. Resulting in the skin looking healthy and plumper. Perk Eye Service – in as little as 10 minutes, a Perk treatment focuses on lightly replenishing the eye area. Injectables – Injecting a muscle relaxant into the treatment area paralyses the muscle and reduces the visual signs of the fine lines and wrinkles. 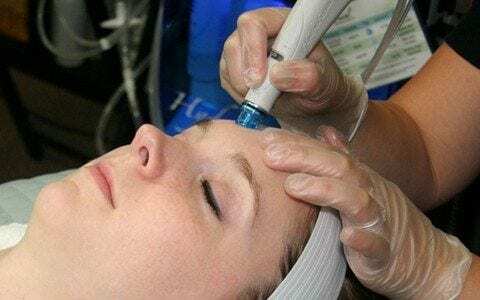 Micro Needling – eDs Dermastamp – it’s a non-surgical skin- tightening treatment.